It's not a gadget for rich and famous, it's just elite enough to make you feel like one. Meet someone that you would love to have in your kitchen. An ambassador for efficient cooking, the VIC-07 is an induction cook top from V-Guard that's sure to save your fuel, effort and time that goes into cooking. Toss your recipes between various optimum temperatures with its 8 stage power & temperature setting feature and become a cooking connoisseur. Trust its wide working range for a smooth functioning and a great experience while cooking those delicious meals for your family. Its A-grade crystalline ceramic glass gives it a beautiful finish that adds to the beauty of your kitchen. Choose freedom from the hassle of getting your gas cylinders refilled and cook tension free with this amazing cook top. Its soft knobs, preset functions and voltage cut off feature adds to its charm. The appliance would just glam up your kitchen and you'll forget the times of traditional cooking on gas when you used to suddenly run out of it in the middle of a dish. 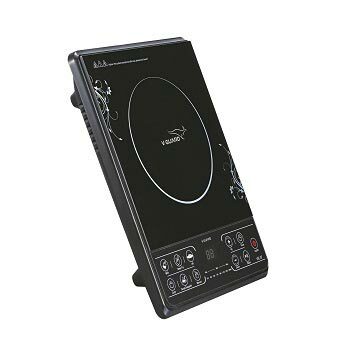 So welcome this hassle free induction cook top to your home and enjoy convenient cooking with V-Guard.